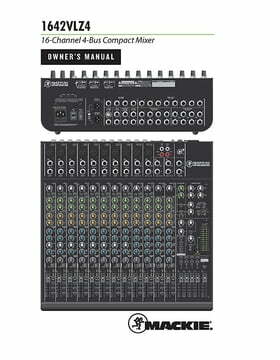 Compact 16-Channel MixerThe 16-channel 1642VLZ4 mixer features Mackies renowned Onyx preamps in a compact design - perfect for bands, clubs and more. For a clean and distortion free signal the 1642VLZ4 provides a maximum of headroom and signal-to-noise ratio from every input to every output. Moreover the 1642VLZ4 impresses with its solid design as well as with a high contrast coloring of the ergonomic surface, enabling simple and intuitive handling. 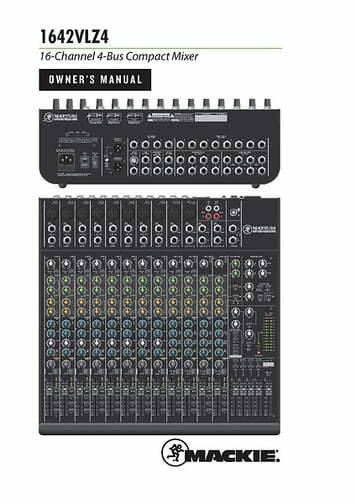 Additional features like the control room section and extended return section the 1642VLZ4 is the first choice for everyone, looking for a flexible and efficient mixer for professional applications. I've been producing and mixing records for twenty years now and have had a digital desk from day one, starting off with a Yamaha Promix and eventually ending up with a Yamaha 02R96. A few years ago I sold the 02R96 and went 'in-the-box' using Logic and various plugins from developers like UAD, Slate and Softtube. 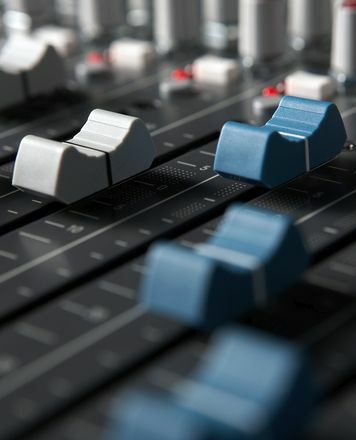 I always missed the hands-on feel of faders though and did a lot of research about DAW controllers like the AVID Artist Mix and upcoming Behringer X-Touch but was never quite convinced they would work for me. I use vintage drum machines and also wanted a desk I could hook up to those and use independently of Logic and my computer. One of the main benefits of digital desks or mixing in-the-box is that you can save and recall mixes and tweak them forever. But this can also a problem in that you rarely need to commit absolutely, and it's harder (for me) to know when something's finished. I decided I'd like to try an all analogue desk and after seeing what else was available went with the Mackie 1642. Obviously benefiting from decades of R+D and economies of scale I was blown away by the quality of this desk. Solid, heavyweight chassis with a classy powder coat finish, great feeling pots and super smooth faders. Obviously that means nothing if the sound isn't there and again, I was massively impressed. Crystal clear sound, really nice EQ, loads of routing options and a really cool sounding distortion when the channel input is overdriven. I run my old drum machines into various coloured DI's before going into the Mackie and couldn't be happier with the result. It's little scary knowing when I've finished a mix and pull the faders down, that's it, I can't recall it, but at the same time it's been liberating, I'm working faster and enjoying it way more that I did mixing in-the-box. This would be a great desk at any price but for what Thomann is selling it for, it's nothing short of amazing!!! Dispatched 12th September 2016. Delivered 16th September 2016 to the UK. This is a difficult review to write as I have always understood Mackie to be a good quality product. 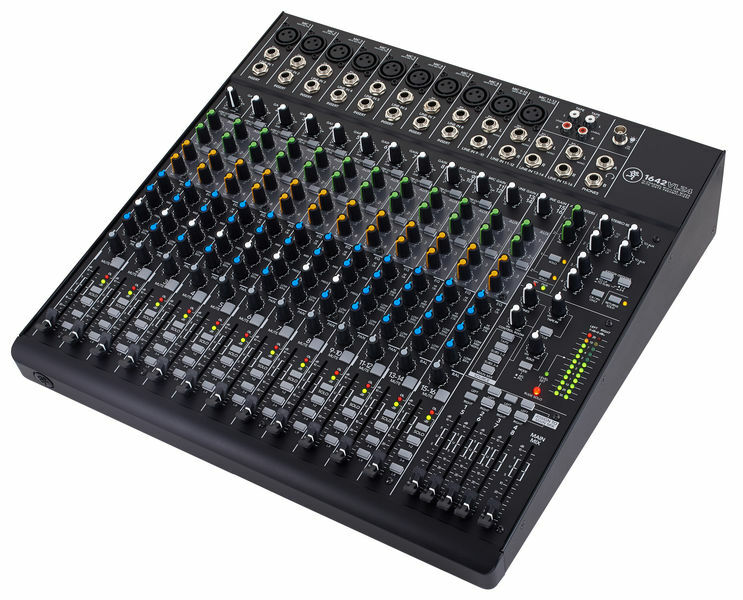 In fact I have a Mackie desk in my studio and have been happy with it for some years (apart from a mute button which requires an extra hard push).I bought the 1642 VLZ4 mixer after reading the review here and based on my previous experience. Overall when I unboxed the unit all seemed well the faders, switches and buttons all felt well built and responsive. The black on black faders however are not the easiest to see in a dark environment and a desk light will be required. The major issue occurred the first time I had the chance to use the mixer with all channels plugged in 17th September 2016. Channel 5 simply did not work and two of the line in plugs at 13 and 14 crackled and popped as the gain was increased. The reason why I have given such a low score for quality is that quality control must come under this heading and how the unit left the factory unchecked must reflect on this.  ID: 319327 © 1996–2019 Thomann GmbH Thomann loves you, because you rock!